"Fred Meyer Palmer mural by Ruth Hulbert"
We at the Valley Arts Alliance are very pleased to be involved in the selection and procurement of the artwork at the new Fred Meyer store in Palmer. Ruth Hulbert, a fourth-generation Alaskan, was selected to provide the mural placed in the cafeteria area. Ruth was born and raised in Palmer. She has a BA in biology and painting from Western Washington University, and a certificate in science illustration from the University of Washington. 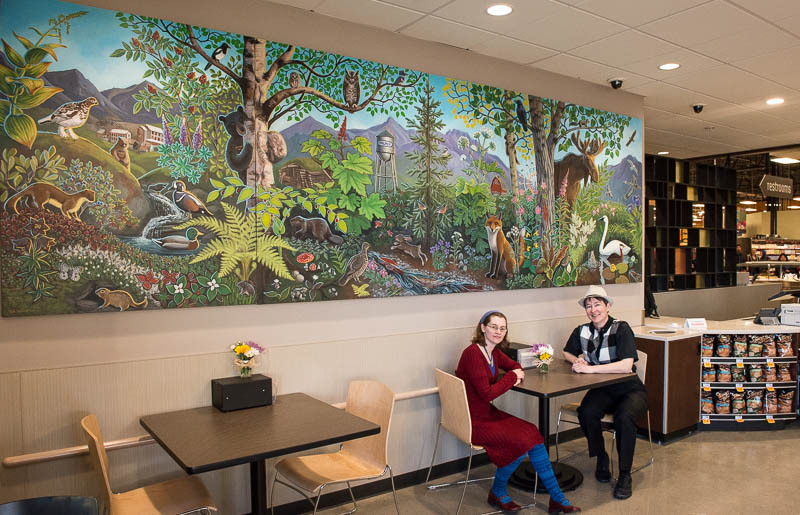 Ruth’s mural is a stylized cross-section of the Palmer area, from Hatcher Pass to the Hayflats, condensed into a single colorful patch of forest. Through the trees you can glimpse a bit of Independence Mine, a cabin, the Palmer water tower, a Colony farm, and the Alaska State Fair. The old cabin depicted is the one built by John Bugge, who homesteaded in Palmer in 1914. The new Fred Meyer store sits in what was once John Bugge’s hay field. From native Dena’ina and Ahtna, prospectors, homesteaders, colonists, up to the most recent cheechakos, all those who have lived or traded here have left some mark on the landscape. Look closely at Ruth’s mural and find traces of some of the languages spoken here over the years, in the names of plants and animals. Ruth has provided us with a list of all the plants and animals in her mural, in four different languages: the common name, the taxonomic name, the Dena’ina name, and the Ahtna name. “—In English, we say "willow" and "willow ptarmigan," using the name of the plant to refer to the bird. In Dena'ina, ptarmigan is "delggema" and dwarf willow is "delggema duna" or "ptarmigan food" -- so they use the name of the bird to refer to the plant. “—Club moss in Dena'ina is "d'lina kala" which means "mouse's tail," so I painted the mouse and club moss next to each other.